Brochures containing messages developed according to the Extended Parallel Process Model were deployed to increase intentions to use hearing protection for college students. These brochures were presented to one-half of a college student sample, after which a questionnaire was administered to assess perceptions of threat, efficacy, and behavioral intentions. The other half of the sample completed the questionnaire and then received brochures. Results indicated that people receiving the brochure before the questionnaire reported greater perceptions of hearing loss threat and efficacy to use ear plugs when in loud environments, however, intentions to use ear plugs were unchanged. Distribution of the brochure also resulted in greater perceptions of hearing loss threat and efficacy to use over-the-ear headphones when using devices such as MP3 players. In this case, however, intentions to use over-the-ear headphones increased. Results are discussed in terms of future research and practical applications. The present study is aimed to investigate the impact of noise pollution on residents/community residing near roadside. The degree of annoyance was assessed by means of a questionnaire. It was found that among all noise-generating sources, road traffic was the major source of noise followed by factory/machines. A health survey reported about 52% of population was suffering by frequent irritation. 46% respondent felt hypertension, and 48.6% observed loss of sleep due to noise pollution. Common noise descriptors were also recorded at all the selected sites. 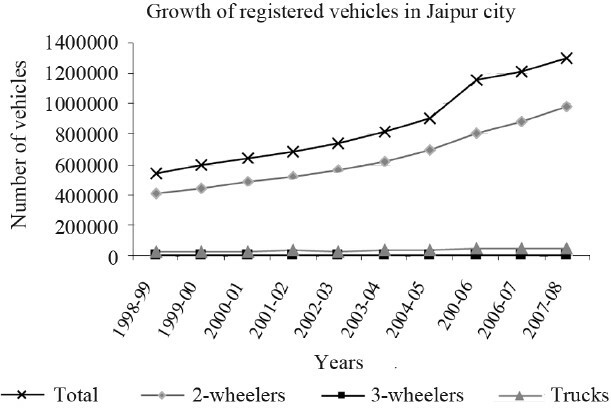 It was found that the Leq values were higher (range 73-86) compared to the permissible values (65 dBA) prescribed by the Central Pollution Control Board, New Delhi. Further, regression equations were developed between various noise indices and percentage of population highly annoyed, and a strong correlation was also observed. The masking effect of a piano composition, played at different speeds and in different octaves, on speech-perception thresholds was investigated in 15 normal-hearing and 14 moderately-hearing-impaired subjects. Running speech (just follow conversation, JFC) testing and use of hearing aids increased the everyday validity of the findings. A comparison was made with standard audiometric noises [International Collegium of Rehabilitative Audiology (ICRA) noise and speech spectrum-filtered noise (SPN)]. All masking sounds, music or noise, were presented at the same equivalent sound level (50 dBA). The results showed a significant effect of piano performance speed and octave (P<.01). Low octave and fast tempo had the largest effect; and high octave and slow tempo, the smallest. Music had a lower masking effect than did ICRA noise with two or six speakers at normal vocal effort (P<.01) and SPN (P<.05). Subjects with hearing loss had higher masked thresholds than the normal-hearing subjects (P<.01), but there were smaller differences between masking conditions (P<.01). It is pointed out that music offers an interesting opportunity for studying masking under realistic conditions, where spectral and temporal features can be varied independently. The results have implications for composing music with vocal parts, designing acoustic environments and creating a balance between speech perception and privacy in social settings. Increasing evidence indicates that chronic exposure to environmental noise may permanently affect the central nervous system. The aim of this study was to evaluate the long-term effects of early exposure to environmental noise on the hippocampal cell proliferation of the adult male rat. Early-weaned Wistar rats were exposed for 15 days to a rats' audiogram-fitted adaptation to a noisy environment. Two months later, the rats were injected with the cellular proliferation marker 5΄bromodeoxiuridine (BrdU), and their brains were processed for immunohistochemical analysis. Coronal sections were immunolabeled with anti-BrdU antibodies to identify new-born cells in dentate gyrus (DG), cornu amonis areas CA1 and CA3. In addition, blood samples were obtained to evaluate corticosterone serum levels after noise exposure. All data are expressed as mean΁standard deviation. For mean comparisons between groups, we used the Student t test. 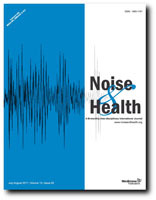 We found an increase in corticosterone serum levels after environmental noise exposure. Interestingly, noise-exposed rats showed a long-term reduction of proliferating cells in the hippocampal formation, as compared to controls. These findings indicate that chronic environmental noise exposure at young ages produces persistent non-auditory impairment that modifies cell proliferation in the hippocampal formation. Both the antioxidant, N-l-acetyl cysteine (NAC), and the Src inhibitor, KX1-004, have been used to protect the cochlea from hazardous noise. In order to extend our previous work on KX1-004 with noise exposure, the current studies were undertaken with two goals: (1) to test the effectiveness of NAC and KX1-004 in combination with one another when given in a protection paradigm, and (2) to test the NAC+KX1-004 combination in a postexposure rescue paradigm. The noise exposure for the first experiment consisted of a 4-kHz octave band of noise at 107 dB SPL for 2 hours. The combination of NAC and KX1-004 were administered either prior to the noise exposure or post exposure (rescue). The second experiment was undertaken to extend the findings of the first experiment's rescue paradigm. The 4 kHz octave band noise was delivered at 112 dB SPL for 1 hour, with the experimental drugs delivered only in a rescue paradigm. 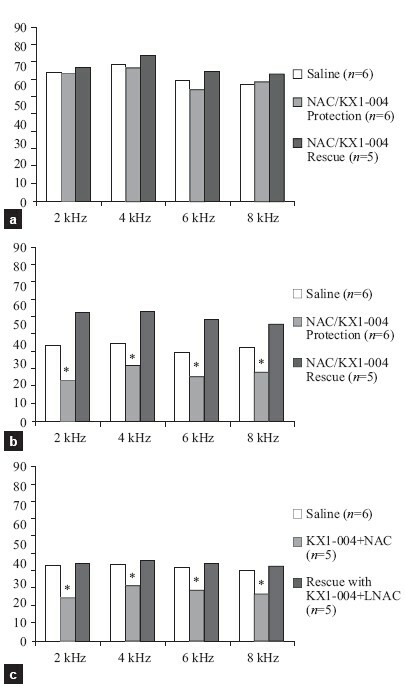 In Experiment 1, animals treated before the 2-hour noise exposure with the combination of NAC and KX1-004 had from 12 to 17 dB less permanent threshold shift when compared to control saline treated animals. Treatment in the rescue paradigm did not produce any reductions in threshold shift from the 2-hour exposure. In the second experiment, with the 1-hour noise, rescue with KX1-004 or KX1-004 plus NAC yielded small, but significant, reductions in threshold shift. There was no additional benefit from the combination of NAC and KX1-004 over KX1-004 by itself. 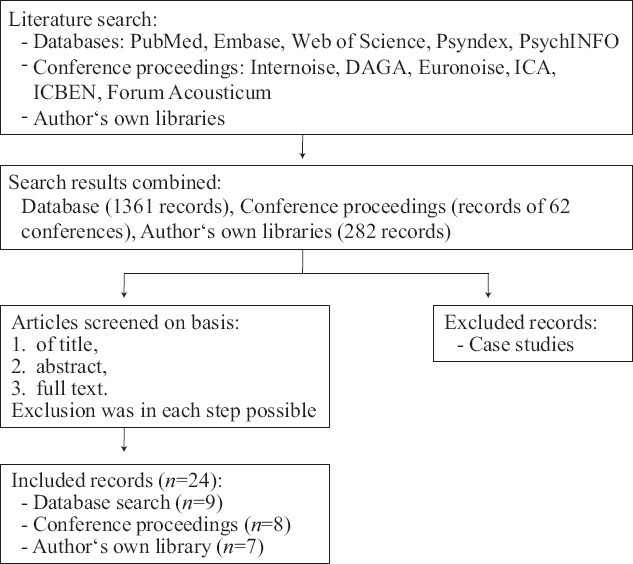 This article reviews the literature about the effects of specific non-traffic-related ambient noise sources on sleep that appeared in the last two decades. Although everybody is faced with noise of non-traffic and non-industry origin (e.g. sounds made by neighbors, talk, laughter, music, slamming doors, structural equipment, ventilation, heat pumps, noise from animals, barking dogs, outdoor events etc. ), little scientific knowledge exists about its effects on sleep. The findings of the present extensive literature search and review are as follows: Only a small number of surveys, laboratory and field studies about mainly neighborhood, leisure and animal noise have been carried out. Most of them indicate that ambient noise has some effect on human sleep. However, a quantitative meta-analysis and comparison is not possible due to the small number of studies available and at times large differences in quality. Music and high levels of sound have not traditionally been associated with risk-taking behaviors. Loud music may intensify and bring more power and meaning to the musical experience, but it can at the same time be harmful to hearing. The present study aims to increase the knowledge about young women's and men's risk judgement and behaviour by investigating patterns in adolescent risk activities among 310 adolescents aged 15-20 (143 women; 167 men). The Australian instrument ARQ was used with additional questions on hearing risks and a factor analysis was conducted. The main results showed that the factor structure in the judgement and behavior scale for Swedish adolescents was rather different from the factor structure in the Australian sample. Also, the factor structure was not similar to the Australian sample split on gender. The results are discussed from a gender- and existential perspective on risk taking, and it is emphasized that research on risk behavior needs to reconceptualize stereotypical ideas about gender and the existential period in adolescence. The influence of military service on self-assessed hearing symptoms and measured auditory function was studied as well as the efficacy of the Hearing Conservation Program (HCP) of the Swedish Armed Forces. 839 conscripts were recruited for the study at reporting to military service. They were all exposed to noise over the risk-limits from weapons and vehicles and used earmuffs and/or earplugs. Questionnaires and pure tone screening audiometry were studied at the start and the end of the military service. Retrospective information regarding audiometry at conscription before military service was included as control. The prevalence values of tinnitus were 23% before and 32% after the service and of sensitivity to noise 16% and 19% respectively. The prevalence values of hearing impairment were 6.3% at conscription, 14.5% at reporting to military service, and 24% after the training period. The incidence values of hearing decline were 3.7% during the period with no military noise exposure and 6.6% during the military service. Acoustic accident increased the risk of worsened tinnitus and sensitivity to noise four times and for a high frequency hearing decline six times. We observed elevated prevalence values of tinnitus, sensitivity to noise and hearing impairment at discharge compared to before military service. We observed an elevated risk of hearing decline during military service. Acoustic accident increased the risk of tinnitus, noise sensitivity and hearing decline. We suggest improvements regarding inclusion criteria for military service, and for education regarding the HCP.